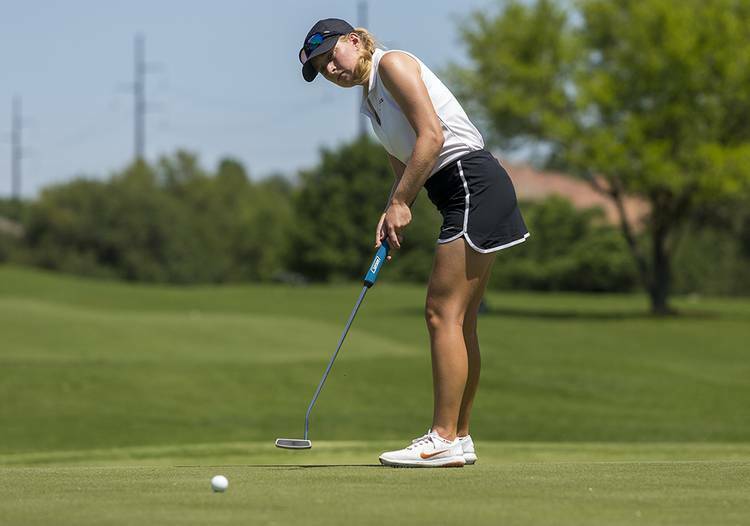 The Texas women’s golf team shot 285 followed by a 281 to sit in fifth place after two rounds at the ANNIKA Intercollegiate Tuesday in Lake Elmo, Minn.
Kaitlyn Papp led the Longhorns as she shot two rounds in the 60s on the day. Papp sits in a tie for fifth after shooting 68 and 69 in the first two rounds. At 7 under par, Papp trails leader Ana Belac of Duke by four strokes. The Longhorns, at 10 under par, trail first place Duke by nine strokes. Hailee Cooper is even and sits in a tie for 24th. Emilee Hoffman and Sara Kouskova sit in a tie for 29th at 1 over par while Agathe Laisne is a stroke back and tied for 35th. Laisne shot her collegiate best 68 in the second round. The tournament, which features nine top-10 teams, concludes Wednesday.